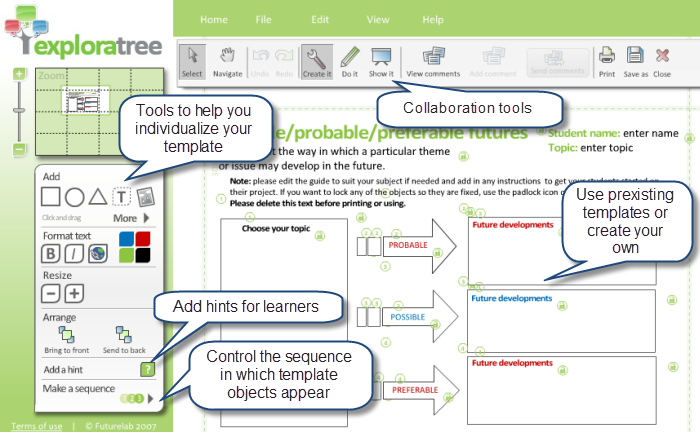 The Exploratree platform by Futurelab provides tools and templates to stimulate reflection and creative thinking. The platform is an outgrowth of Futurelab’s Enquiring Minds Project, a three-year program run by Futurelab and funded by Microsoft. The goal of the project is “to enable students to take more responsibility for the content, processes, and outcomes of their learning.” Although the Enquiring Minds Project came out of classroom studies, the platform’s useful for learners of all types, ages, and settings (e.g., at home, or in professional environments as part of formal or informal learning processes). 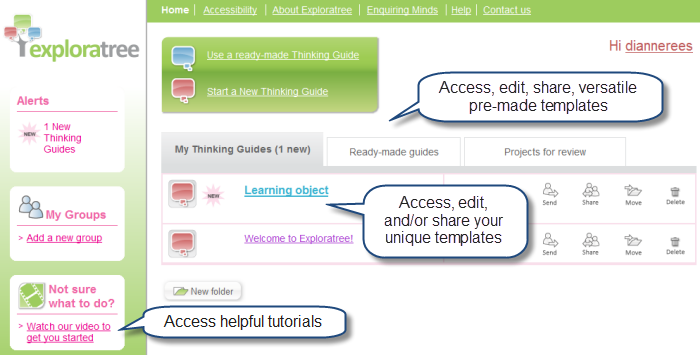 When you register at Exploratree you get access to template tools you can use to create a scaffold to support your learning processes. As shown in the illustration, you have access to helpful tutorials that can guide your use of Exploratree. You can create (which allows you to edit a dashboard), do-it (add to a dashboard) and show-it (share your dashboard with others). Template objects can include images and hyperlinks. If you start with a blank template, you’ll be adding template objects to a blank dashboard by using the shapes and other drawing tools in the side panel on the left. Exploratree offers great support tools for enhancing metacognitive processes. As described in a previous post, metacognition is an important part of intentional learning, since it involves actively thinking about what you know, what you don’t know, and how you can get better at knowing and applying what you know. The pre-made templates provided by Exploratree are great for helping learners analyze, deconstruct, and reconstruct their learning processes. As an instructor, you can easily modify the Exploratree templates for your own instructional purposes or create completely new ones to serve as scaffolds for instructional modules you’re creating. You can use Exploratree to create stand-alone learning objects or to integrate learning objects with other learning resources (e.g., a Web site, using your learning template as a student guide, as part of a face-to-face (f2f) course of instruction, or as part of an approach that blends elearning and f2f instruction). Other uses for Exploratree include creating collaborative storyboarding templates and creating templates for course outlines. Exploratree is still in Beta, so I’m really excited to see how this platform evolves.